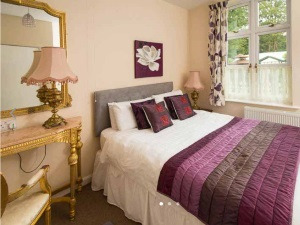 Heywood Hall01889 591747work Guest AccommodationA beautiful family owned and run guest house offering 6 self catering suites from 2 to 6 guests. There are two spacious romantic couple suites. Larger family suites have two bedrooms, ideal for parents with older children. There is a hot tub and sauna on site for guests use and a pretty courtyard to relax after a long day. Picnic tables placed near the trees and a pretty stream for you to enjoy a barbeque or glass of wine. 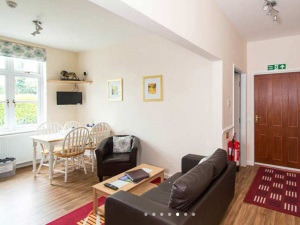 Ideally placed for walking in the Staffordshire Peak District and visiting Alton Towers. The Staffordshire Way runs adjacent to the house. Cycle hire is available. A beautiful family owned and run guest house offering 6 self catering suites from 2 to 6 guests. There are two spacious romantic couple suites. Larger family suites have two bedrooms, ideal for parents with older children. There is a hot tub and sauna on site for guests use and a pretty courtyard to relax after a long day. Picnic tables placed near the trees and a pretty stream for you to enjoy a barbeque or glass of wine. For eating out locally the Tavern Pub serves excellent meals and Denstone Hall Farm Shop and Cafe sells award winning local produce. Heywood Hall sometimes limits bookings to 2 or more days. Please note Card Details will be taken at the time of enquiry but these are used as part of a security check only, A Deposit of 50% of the total booking will be taken by Heywood Hall. Elizabeth Suite sometimes limits bookings to 2 or more days. Jennifer Double sometimes limits bookings to 2 or more days. The Jennifer Family Suite accommodation has 2 themed bedrooms in Beach and Jungle styles, large bathroom and dining kitchen. Great for families with children. Jennifer Suite sometimes limits bookings to 2 or more days. The Sally Suite has a Tuscan themed double bedroom, comfortable private lounge and separate dining kitchen, bathroom with bath. Sally double sometimes limits bookings to 2 or more days. Lovely accommodation, very welcoming and beautiful setting. Would definitely recommend this place. Will definitely be returning next time I visit alton towers.